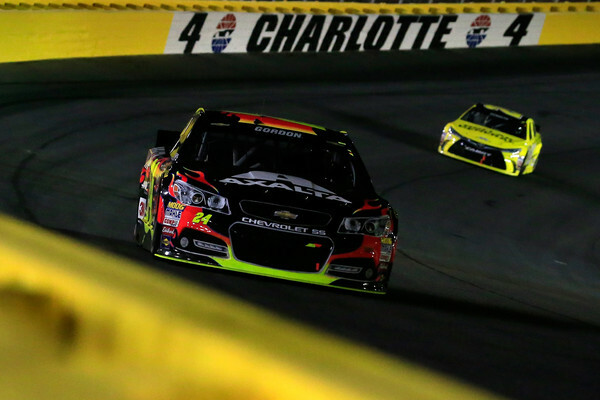 At the outset of the Coca-Cola 600, Jeff Gordon struggled with handling, but he fully expected the handling on the #24 to be dialed in after nightfall. 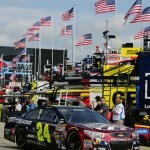 However, the car never performed to Gordon’s expectations and finished 15th in his final start in NASCAR’s longest race. At the front of the field, Carl Edwards scored his first win of the season and 24th of his career. Gordon started 18th and worked his way into the top-15 by the end of lap 11. He ran 15th at the competition caution on lap 25. He restarted 13th on lap 30. 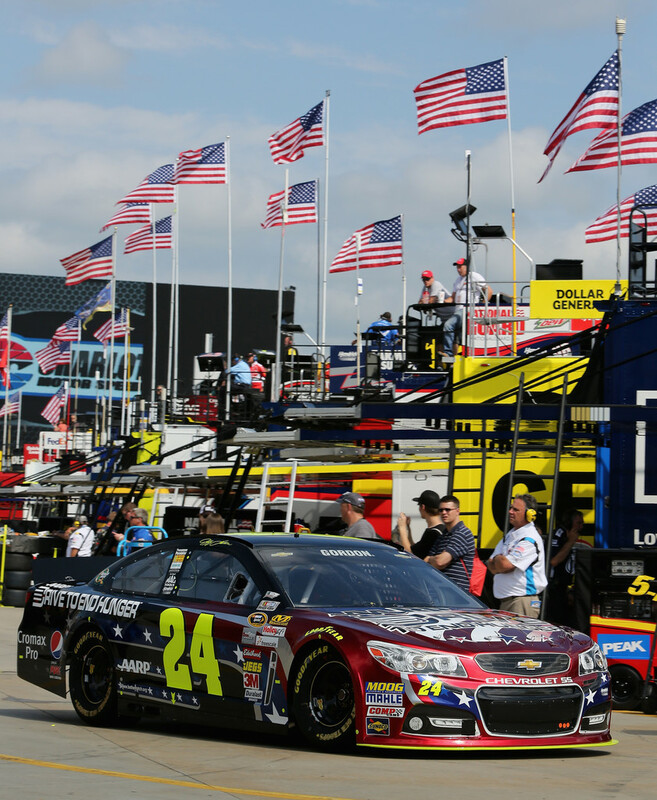 Gordon took 11th from Jimmie Johnson on lap 36, but was unable to gain further ground. 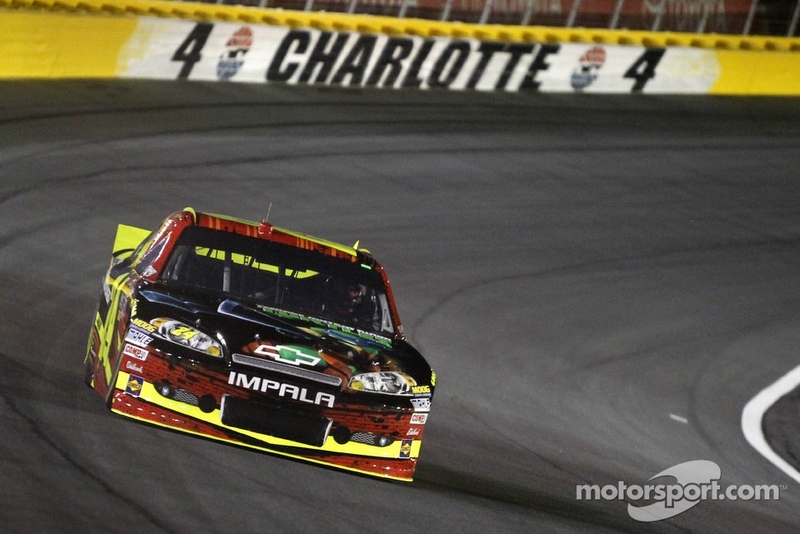 Paul Menard passed to take 11th on lap 64, and Greg Biffle sent Gordon back to 13th on lap 70. He came to pit road for a green flag stop on lap 78 and cycled through in 18th place after adjustments. The next caution waved on lap 90 for Jimmie Johnson’s half spin in turn 4. Pit stops followed with Gordon restarting 21st on lap 94. He struggled on the restart and fell to 26th by lap 100. 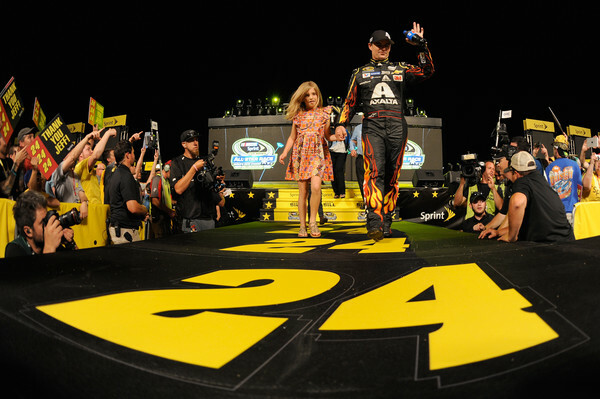 He steadily worked through traffic and ran in 21st place on lap 135. The third caution came on lap 136 for Justin Allagaier’s wall contact. 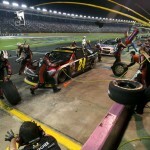 Pit stops followed with Gordon restarting in 19th place on lap 140. He picked up two spots after the restart to run 17th on lap 150. He came to pit road for a green flag stop on lap 188 and cycled through in 13th place. 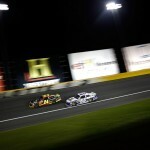 At the halfway point, Gordon ran in 14th place as dusk enveloped the track. A caution for Trevor Bayne’s wall contact on lap 230 brought the lead lap cars to pit road. A miscue on pit road resulted in Gordon coming back in to tighten lug nuts. 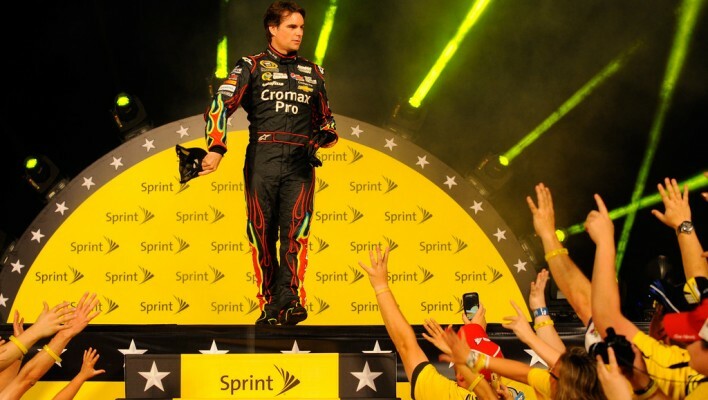 He restarted in 17th place on lap 235 and gained one spot over the next 30 laps. 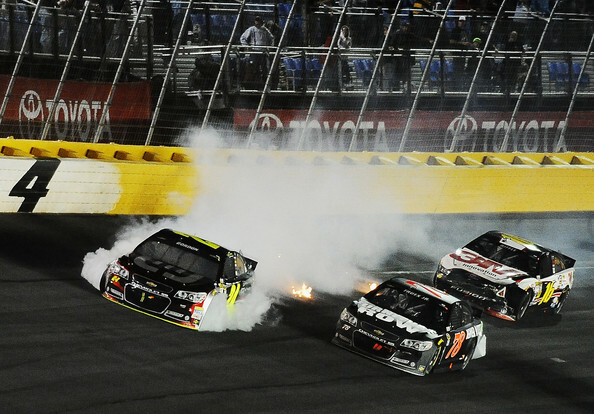 The caution waved on lap 273 for Jimmie Johnson’s crash off of turn 4. 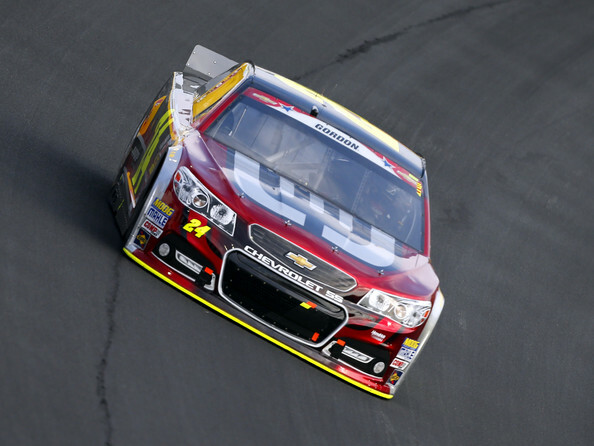 The caution allowed Gordon to make up a 20-second gap to the leader. 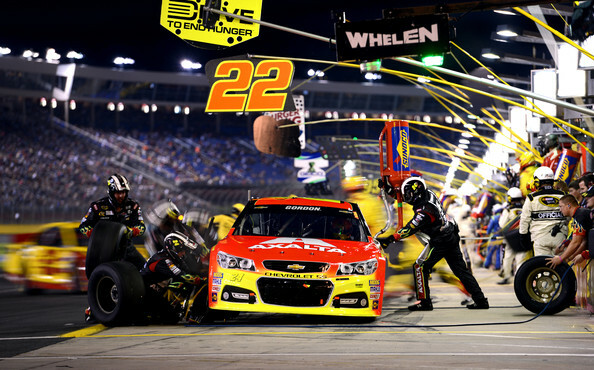 Pit stops ensued with Gordon restarting in 15th place on lap 278. Ryan Blaney’s engine expired on lap 281 to bring out another caution. 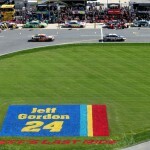 Gordon stayed on the track while most of the lead lap cars pitted. He restarted in 8th place with 110 laps to go. 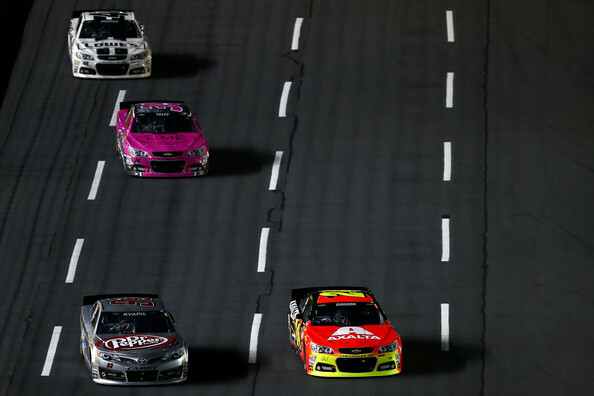 Gordon moved to 7th on the restart, but fell to 9th at the 300-lap mark as Kevin Harvick and Brad Keselowski passed. 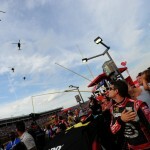 He rebounded to take 8th from Matt Kenseth with 91 to go, albeit briefly as Kurt Busch passed two laps later. 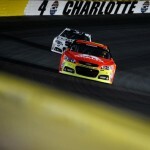 Kasey Kahne sent Gordon back to 10th with 85 to go. A caution with 72 to go for Michael Annett’s spin brought the leaders to pit road. Gordon exited pit road in 11th place. However, he faded to 14th just a lap after the restart. A caution for Ricky Stenhouse’s wall contact slowed the field with 64 to go. Gordon came to pit road for tires and restarted in 13th place. With 40 to go, Gordon moved to 12th with a move around Austin Dillon. He advanced to 11th when Denny Hamlin pitted with a loose wheel. As drivers began pitting, Gordon moved into the top-5 with 20 laps to go. 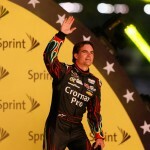 He ran 3rd behind Carl Edwards and Greg Biffle with 19 to go. Gordon came to pit road with 18 to go and opted for 2 tires. He cycled through in 16th place and finished the event in 15th. 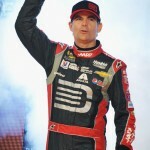 Jeff Gordon took a step toward the third round of the Chase with a second place effort under the lights at Charlotte Motor Speedway. Gordon finished where he started the event behind pole sitter (and race winner) Kevin Harvick. 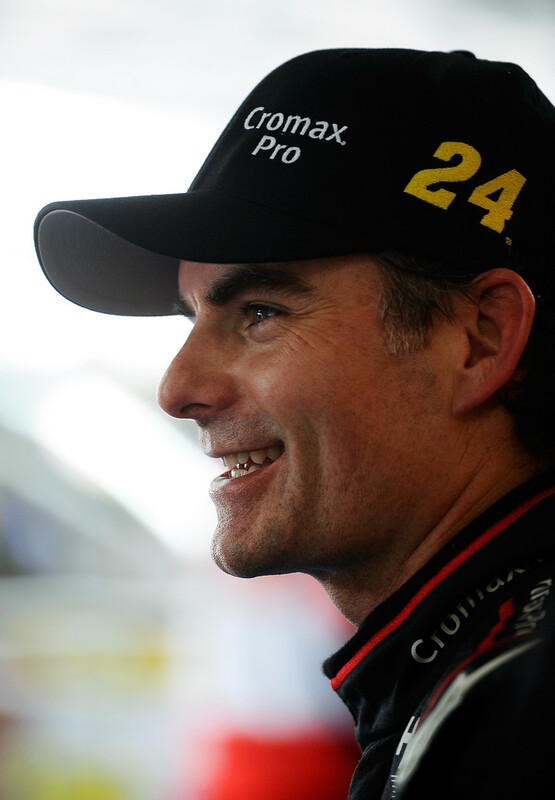 Heading into Talladega, Gordon has an 18 point cushion on the Chase cutoff as the second round concludes in Alabama. 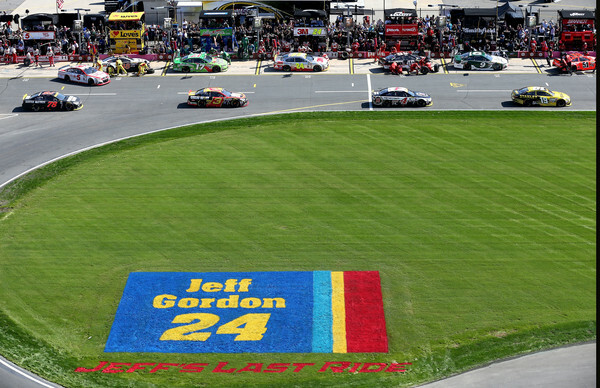 Gordon started on the outside of the front row and ran in 2nd behind Kyle Busch for the first 13 laps. He took the race lead from Busch on lap 14 and pulled away until the competition caution on lap 25. He exited pit road after a four tire change in 4th place after two drivers opted for two tires. 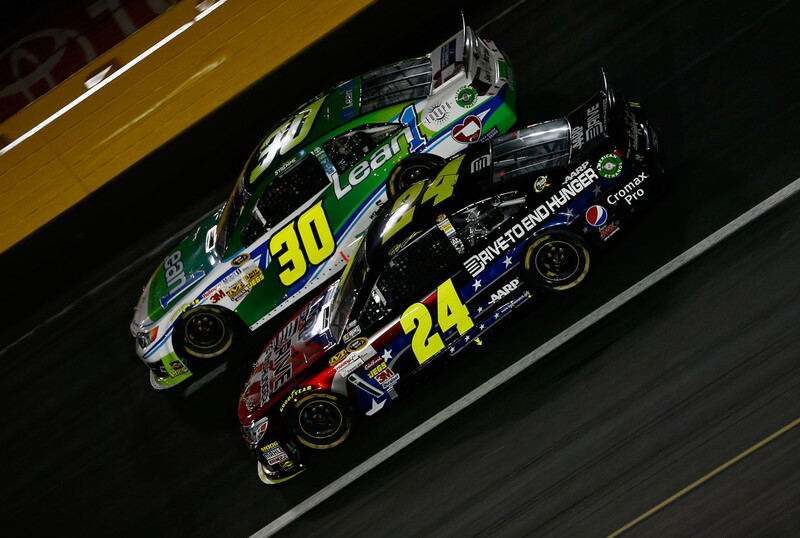 On the restart, Gordon made quick work of Danica Patrick and Dale Earnhardt Jr and moved to 2nd behind Busch. He re-assumed the top spot by passing Busch on lap 38. 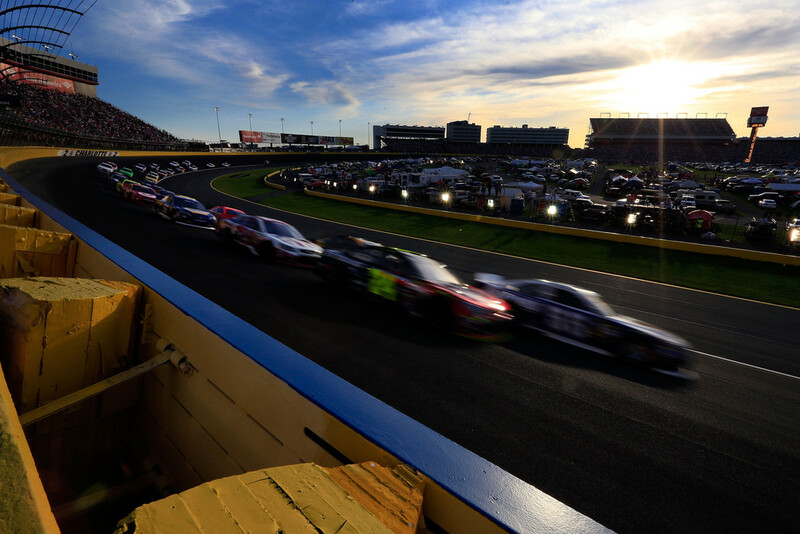 Gordon kept the race lead over Kevin Harvick through a round of green flag pit stops on lap 75. The next caution came on lap 95 after Clint Bowyer’s engine expired. Gordon again opted for four tires and restarted in 3rd place. 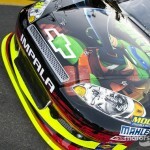 He took 2nd from Jamie McMurray on lap 111, but ran 3 seconds behind Harvick. A caution on lap 135 for Paul Menard’s engine brought the leaders to pit road. 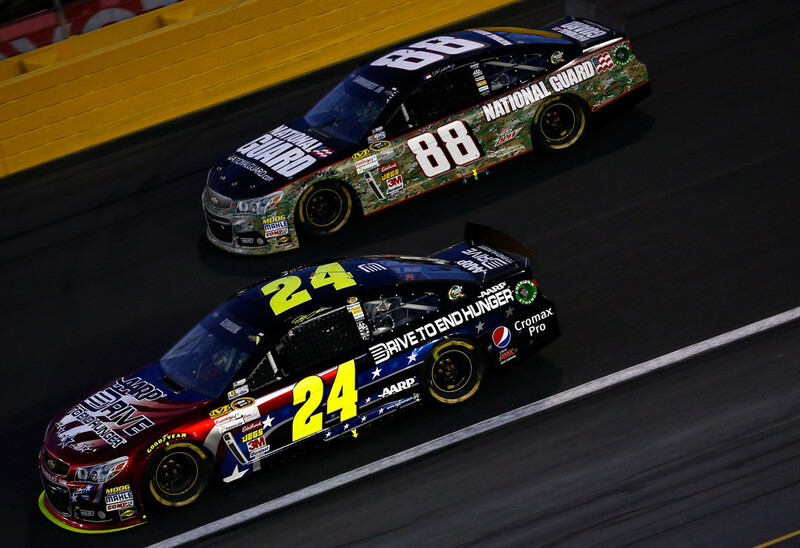 Gordon restarted in 2nd along side Harvick on lap 144, but fell to 4th on the inside line. He came to pit road for a green flag stop on lap 190 while battling a tight handling issue. 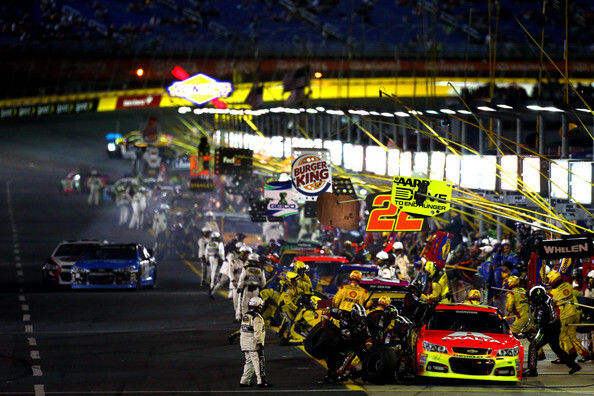 Following stops, Gordon ran in 5th place behind Harvick, McMurray, Kurt Busch, and Kyle Larson. A caution for Josh Wise’s engine on lap 222 brought the lead lap cars to pit road. 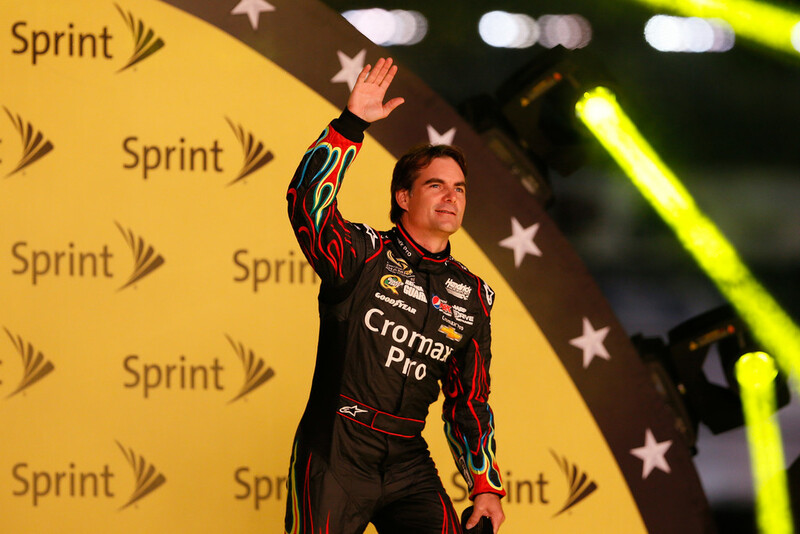 He restarted in 5th place, but struggled on the inside and dropped to 9th on lap 228. Brian Vickers’ spin on lap 237 brought the caution. Pit stops ensued with Gordon opting for 2 tires. 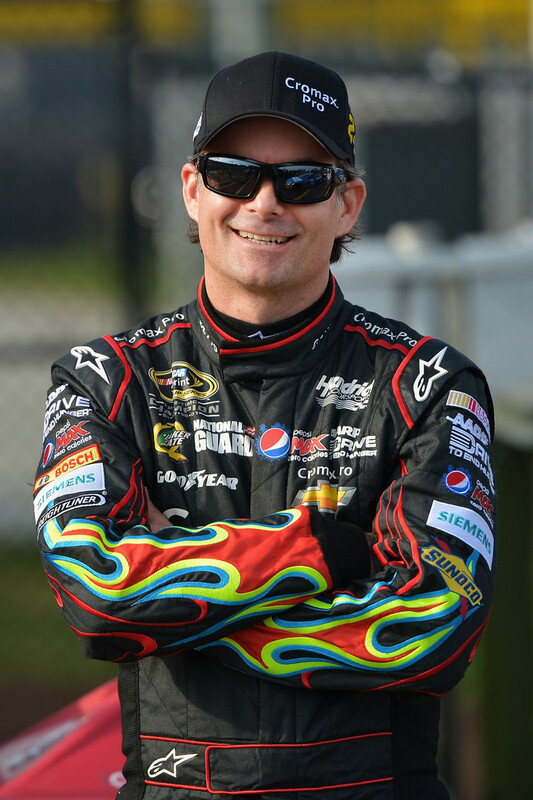 He restarted in 7th place on lap 242. The next caution came on lap 245 when Joey Logano spun Danica Patrick in turn 4. Gordon again restarted 7th on the inside line. He ran 8th when the next caution waved on lap 266. 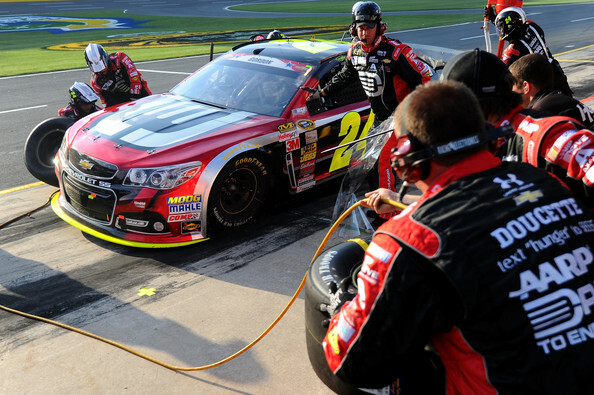 After pit stops, Gordon restarted 9th on lap 270. He moved to 7th within a lap of the restart, and took 6th from Kyle Busch. 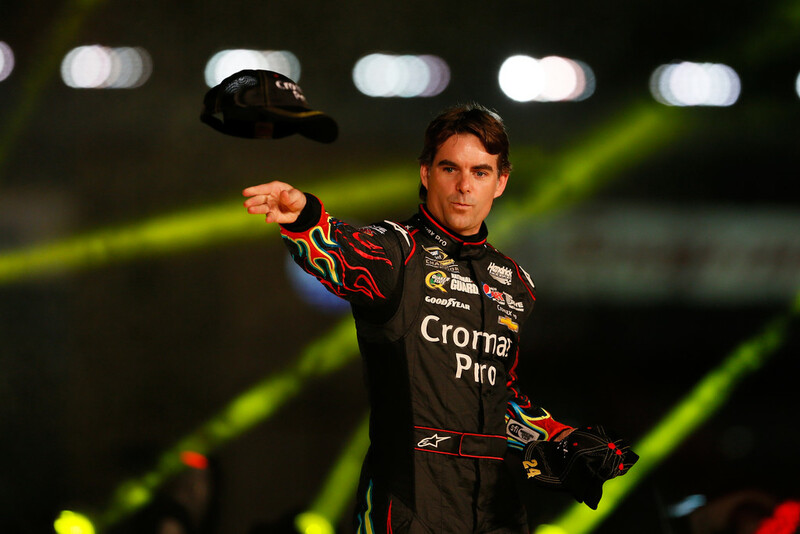 He re-entered the top-5 on lap 284 by passing Brad Keselowski. Three laps later he took 4th from Jimmie Johnson. With 39 to go, he passed Kyle Larson to take over 3rd. 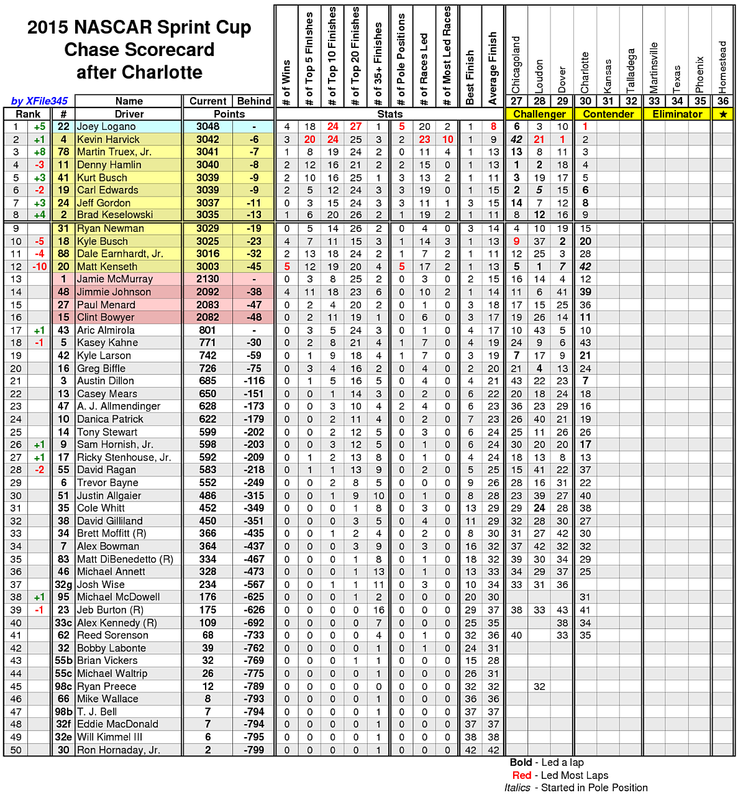 Gordon then tracked down and passed Denny Hamlin for the runner-up spot with 31 to go. Gordon’s final green flag stop came with 22 laps to go. 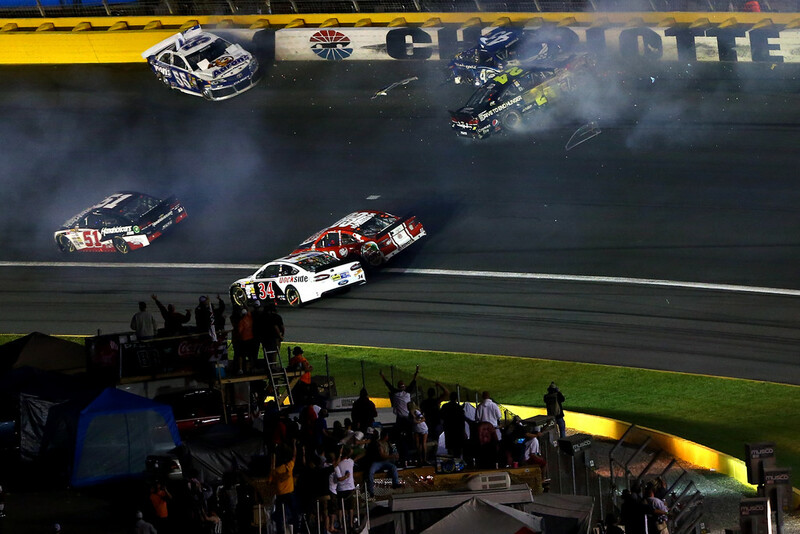 He had to deal with traffic coming off the pit lane and dropped 6 seconds behind Harvick for the race lead. Brian Vickers’ engine brought out the caution with 7 laps to go. 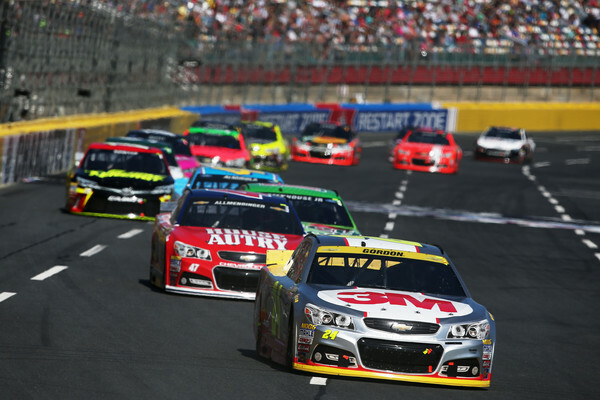 Gordon lined up next to Harvick for the restart with 3 to go. He was unable to make headway on the inside line and finished the event in 2nd place. 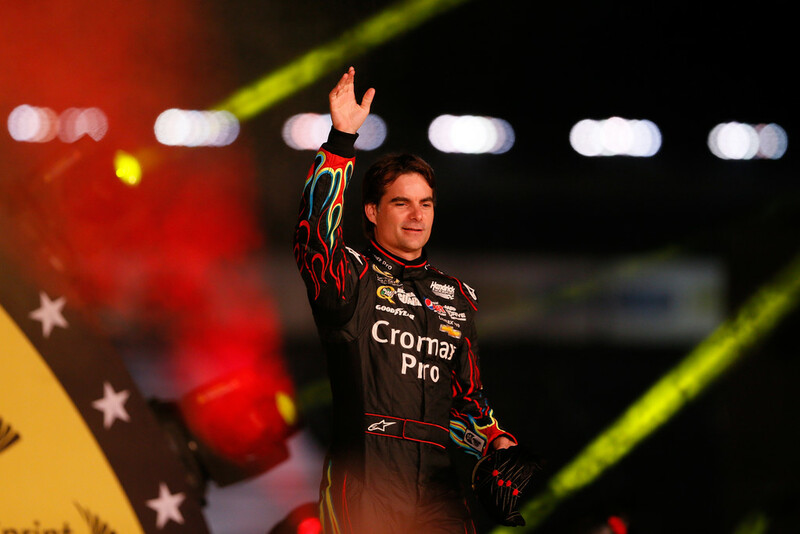 It was his first top-3 finish at Charlotte since he claimed the victory in October 2007 — a span of 14 races. 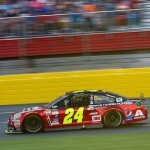 Gordon restarted in 9th place on lap 270. The car came to life on the short run, which put Gordon in position to challenge for the victory. 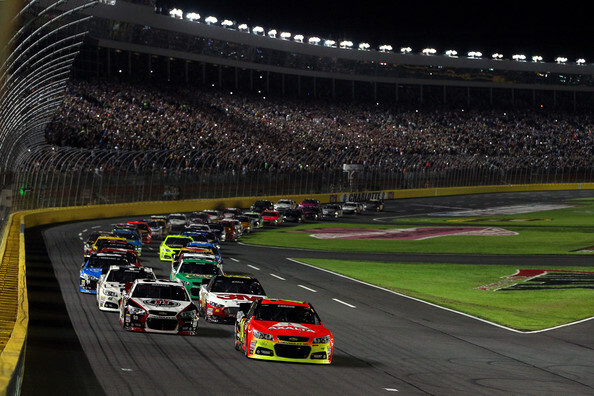 In New Hampshire, you talked a little bit about the danger potentially of having to go into Talladega with all the craziness that can happen there with your fates at hand. I wanted you to elaborate on that, and I wondered how much or how little the potential to have a huge race in Talladega factored into the way you dealt with the race today? “Yeah, I think everybody was pushing hard and now how much was on the line, not just this weekend but last weekend. A win in this particular round, if you want to call it, nobody wants to deal with Talladega. Everybody would like to take the weekend off there if they could. Two guys in some ways get to, and the rest of us are going to have to go race there. We’ve got a little bit of a cushion but not near enough to be comfortable by any means. We’ll go and race the way we normally do there, which is just try to be smart, try to stay out of the mess and then put ourselves in a good position to get a good finish, hope it works out. But yeah, the format is definitely creating a lot of drama, a lot of intensity, a lot of pressure, and each round seems to intensify that much more. Today’s performance by us was huge and crucial, I think, because we do at least have a much bigger buffer than some other guys do. There’s going to be some guys that really have to win at that race and that have to maybe get a top 5 or make up a lot of points. Certainly these last two weeks have shaken things up quite a bit. I like our chances. 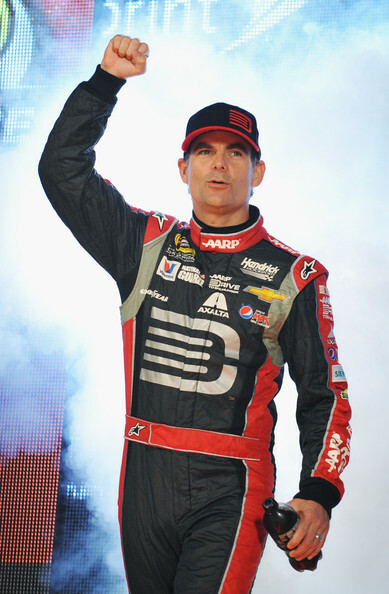 I think we’ve got an excellent race team, and I really hope we can make it through Talladega because I think the next round suits us very, very well. The final caution, did that pump you up thinking, okay, I’ve got another shot at this victory, or was it more pressure, worried that you might lose second place to someone? Is this Chase turning into some bizarre psychological experiment? Seems like people are kind of coming unbolted here as you get down to these rounds. 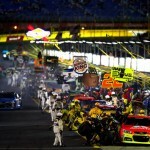 I’m just curious what is your team’s mindset heading to Talladega. You’re still not locked into the Chase. Was it a sense of relief for tonight even though you didn’t get the victory? You’re a guy who doesn’t lose his temper very often. How mad would Matt Kenseth have to be to do that? 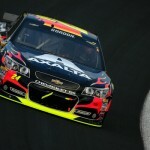 Jeff Gordon finished a hard fought 7th in the Coca-Cola 600 at Charlotte Motor Speedway. 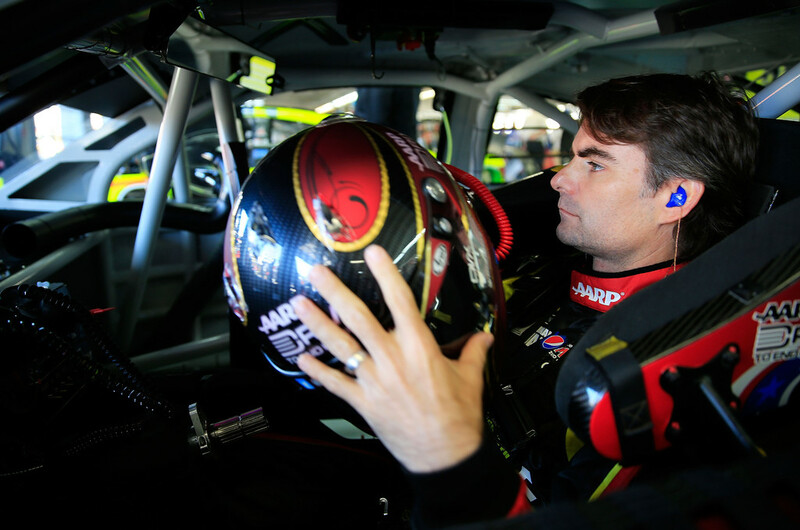 Gordon battled back spasms in the days prior to the race and had Regan Smith standing by in case a relief driver was needed. Smith never put on his uniform as Gordon completed all 600 miles — and nearly scored his 90th career win in the process. 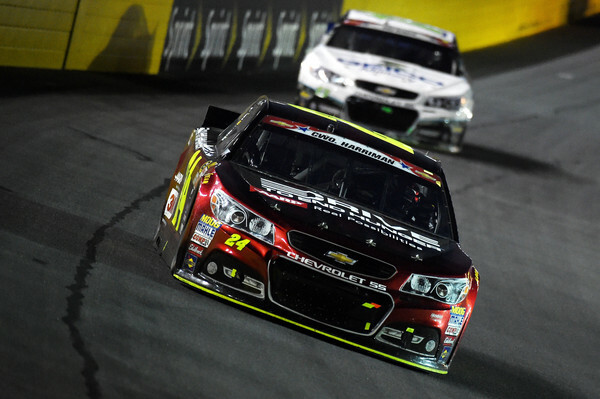 Gordon started 27th and moved into the top-20 within 10 laps. 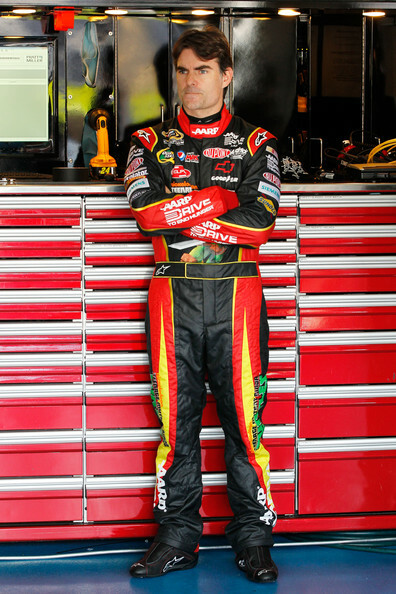 He entered the top-15 with a pass on Justin Allgaier on lap 27. Gordon moved up to 11th prior to a round of green flag pit stops on lap 48. 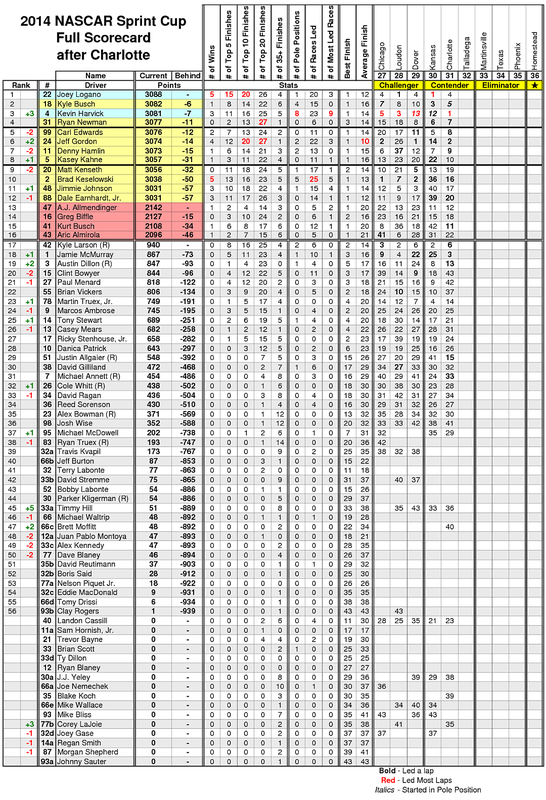 Gordon Cycled through in 12th place. He entered the top-10 on lap 60 with a pass on Denny Hamlin. 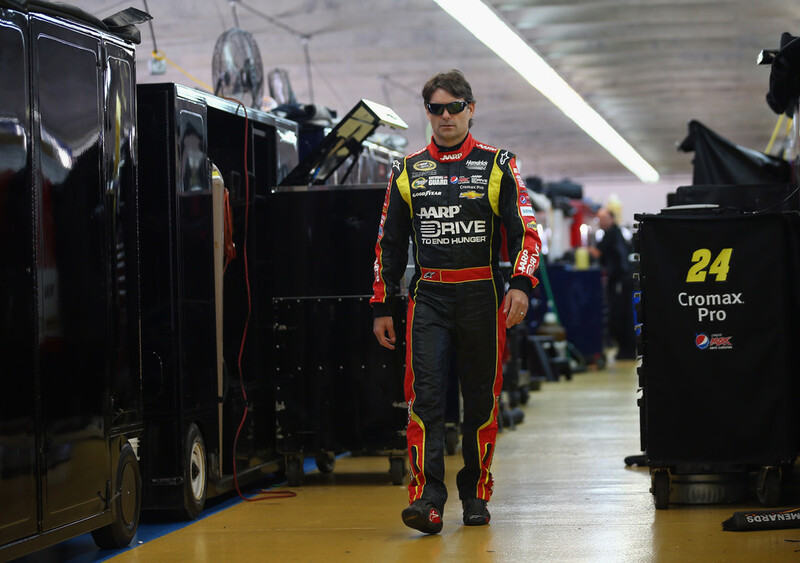 By lap 80, Gordon had advanced to 8th place as the #24 car exceled on the longer run. He came to pit road for tires and fuel on lap 92 and cycled through in 7th place. The first caution waved on lap 109 and brought pit stops. 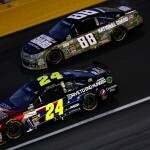 Gordon restarted 6th on lap 114 and took 5th from Dale Earnhardt Jr on lap 115. He took 4th from Matt Kenseth on lap 117. A debris caution on lap 149 brought the leaders to pit road. Gordon slipped to 6th place on lap 155 before a caution for David Gilliland’s cut tire and wall contact. Gordon restarted 8th on lap 168 after opting for four tires. He worked race traffic and moved into the top-5 on lap 183. One lap later he took 4th from Brian Vickers. Earnhardt Jr then passed Gordon on lap 195 for position. At the halfway point, Gordon ran in 5th place. 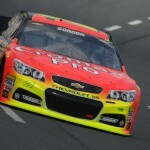 Gordon took 4th from Brad Keselowski on lap 205 and moved to 3rd around Earnhardt Jr on lap 210. 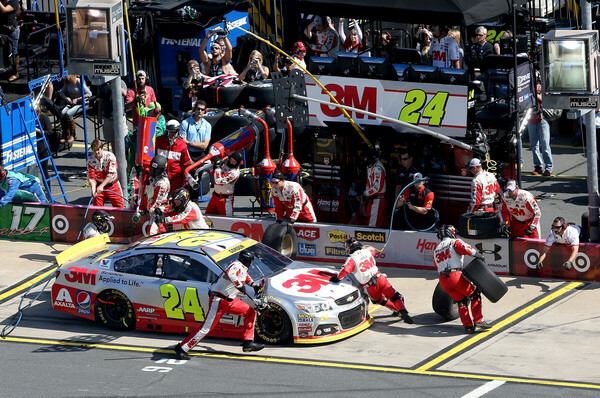 Gordon led a lap during a green flag pit stop sequence on lap 213. 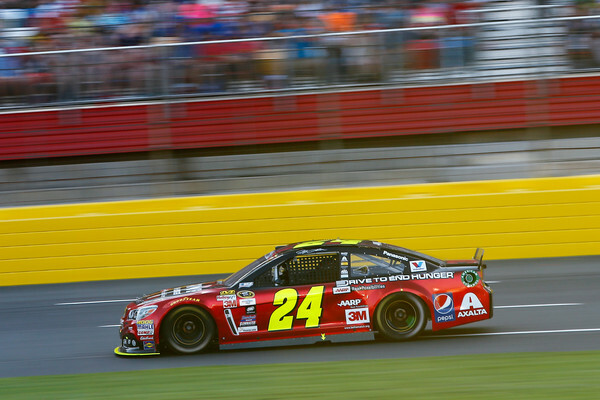 Following stops, Gordon ran in 4th place. A debris caution on lap 222 slowed the field. He came to pit road and restarted in 10th place on lap 227. He advanced to 9th prior to a caution on lap 235 for Marcos Ambrose’s spin. 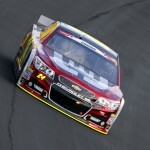 Gordon took 8th from Kyle Busch on lap 246 and moved to 7th on lap 250. 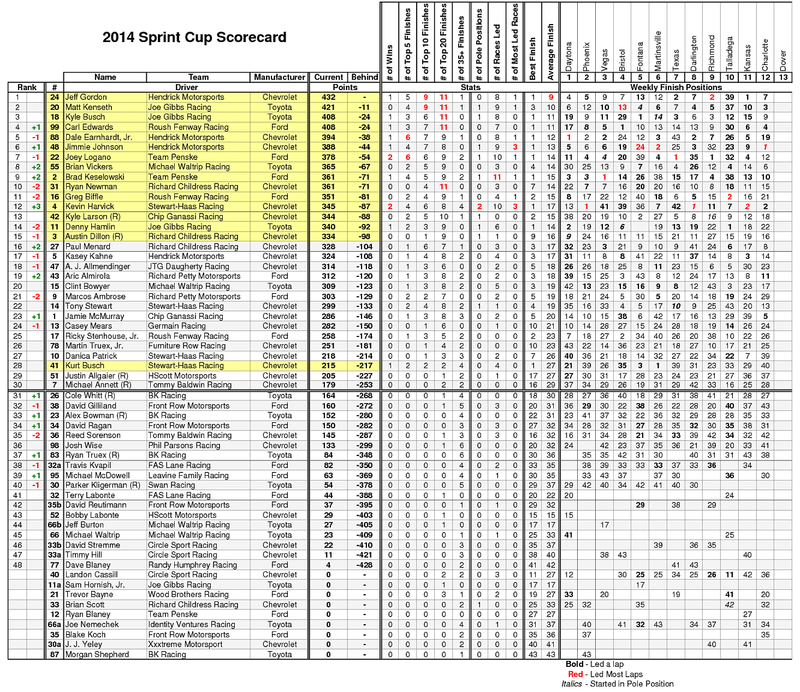 As the run progressed, he took 6th from Joey Logano on lap 257 and re-entered the top 5 on lap 261. 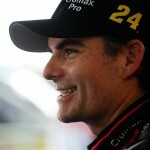 He passed Jimmie Johnson for position and moved to the runner-up spot on lap 272. A caution for Kurt Busch slowed the field on lap 274. Gordon pitted for tires and restarted 3rd on lap 280. 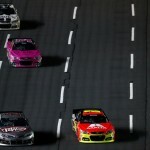 However, he slipped to 5th after the restart as Logano and Martin Truex went by. The next caution waved at lap 285 for Danica Patrick’s blown engine. At the 300-lap mark, Gordon ran in 7th place. He took 6th from Kyle Busch on lap 314 and moved to 5th by lap 320. Gordon came to pit road for green flag stop on lap 330. Gordon cycled through in 3rd place and began closing on race leaders Jimmie Johnson and Matt Kenseth with less than 50 laps to go. He came to pit road for a green flag stop with 25 to go. 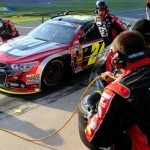 The crew changed two tires and Gordon emerged from the pit sequence ahead of Johnson and Kenseth on the track. Alex Bowman’s cut tire slowed the field with 21 to go. Gordon inherited the lead when Carl Edwards came to pit road for tires and fuel. On the restart with 17 to go, Kenseth got momentum on the outside line and took the race lead. Johnson took 2nd from Gordon with 15 to go. 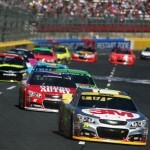 Edwards and Harvick moved around Gordon with 12 to go and McMurray pushed him back to 6th with 10 to go. 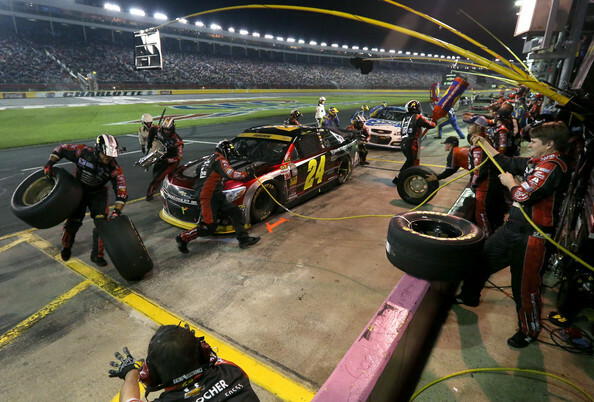 As the laps wound down, the two tires hindered Gordon and he dropped to 7th by the checkered flag. 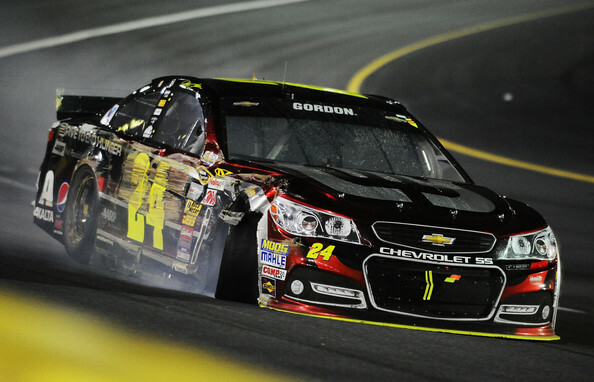 A late two-tire change gave Gordon a chance to win the race. However, a caution flag allowed Kenseth to restart alongside Gordon with four tires. 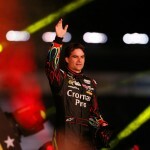 Jeff Gordon finished 7th at Charlotte Motor Speedway. 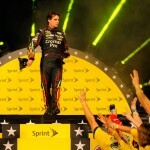 He remains 4th in the NASCAR points standings, 36 points behind Matt Kenseth. 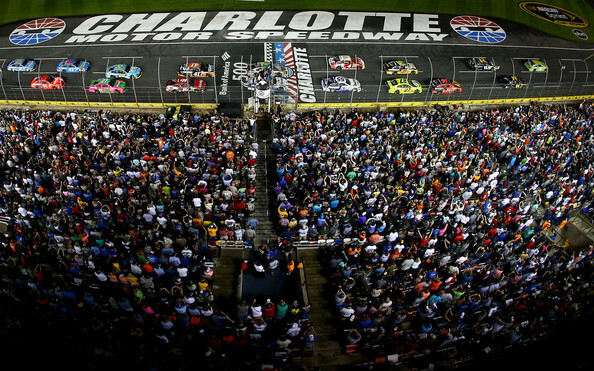 As the polesitter, Gordon led the first 26 laps of the event. 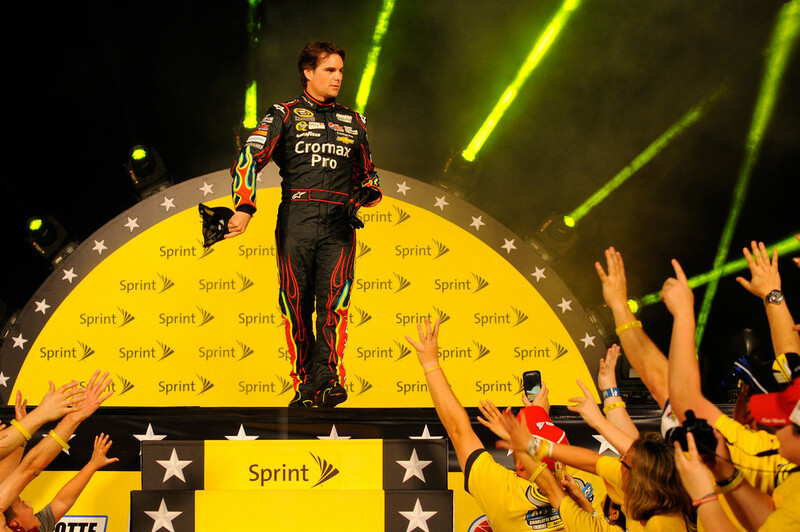 He’s led more laps in the last 7 races (153 laps) than he did in the first 24 races (151 laps) this season. Gordon started on the pole and led the first 25 laps before the caution waved for JJ Yeley’s wall contact. After opting for four tires, Gordon restarted 8th on lap 30. He worked through drivers who took two tires and ran 5th on lap 38. However, he was unable to gain further headway prior to a green flag pit stop on lap 77. The next caution waved on lap 83 for Mark Martin’s engine. 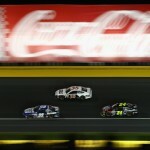 On the restart, Gordon used the outside line to take 3rd from Jimmie Johnson. 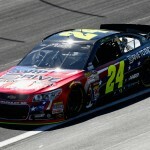 However, he battled a tight handling issue and dropped to 5th as Johnson and Kyle Busch passed by lap 125. Gordon came to pit road for a green flag stop on lap 127. 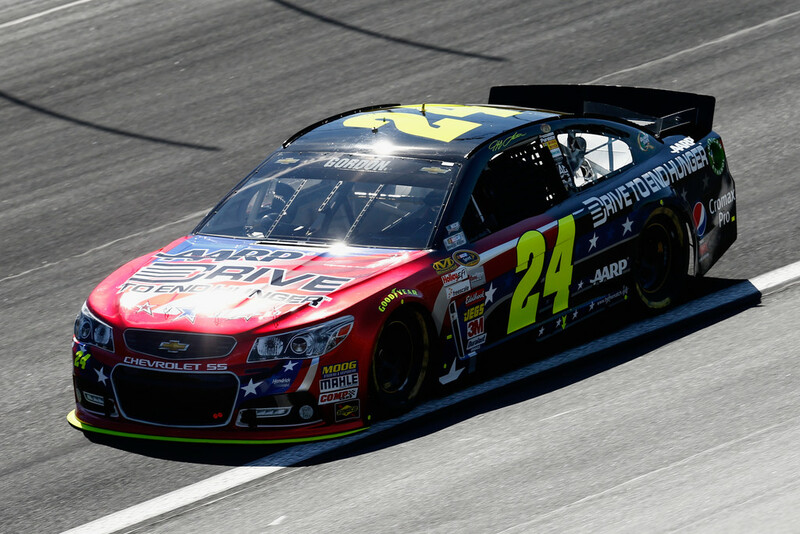 At the halfway point, Gordon ran in 5th place, more than 10 seconds behind race leader Kasey Kahne. A debris caution on lap 172 brought the lead lap cars to pit road. Gordon gained two spots exiting the pits and restarted in 3rd. Kyle Busch went by shortly after the restart to send Gordon to 4th. Matt Kenseth passed on lap 217, which dropped Gordon to 5th. Three laps later Ryan Newman tracked Gordon down for position. He came to pit road for a green flag stop on lap 228. 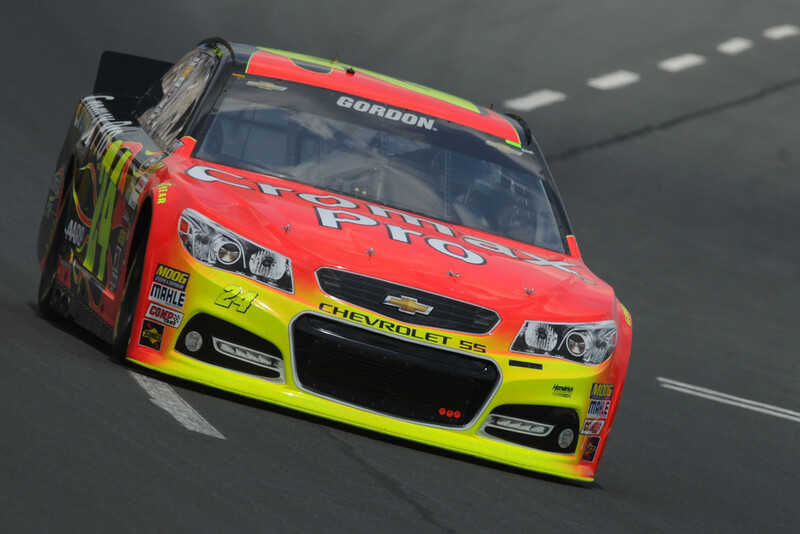 Gordon took 6th from Newman shortly after the stops, but gave the spot back on lap 273. He came to pit road for a green flag stop with 52 laps to go. 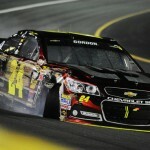 Gordon once again took 6th from Newman after the round of pit stops. A debris caution with 28 laps to go took fuel strategy out of the equation. Gordon opted for two tires and restarted in 2nd place on the outside of Kasey Kahne. Two laps after the restart, Matt Kenseth went by on the high side to send Gordon to 3rd. 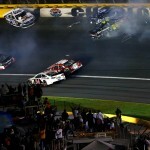 Brad Keselowski passed the #24 car on the backstretch to send him to 4th. 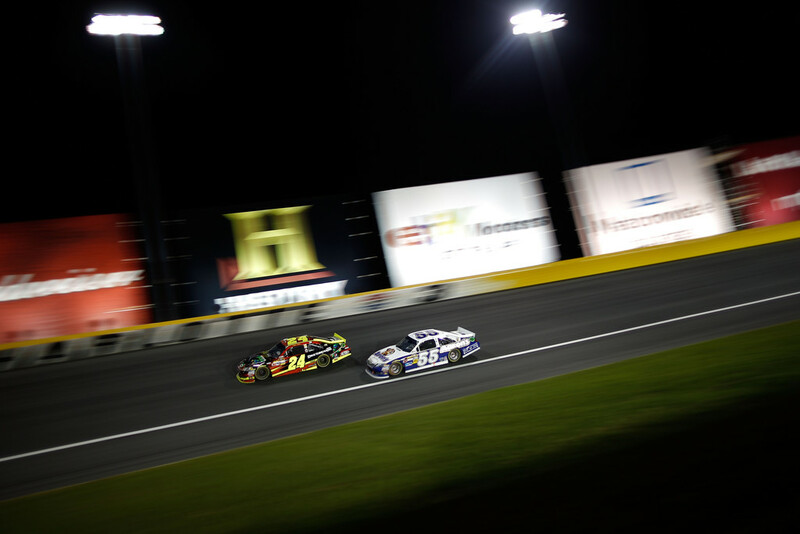 With 19 laps to go, Kyle Busch and Jimmie Johnson passed Gordon for position. 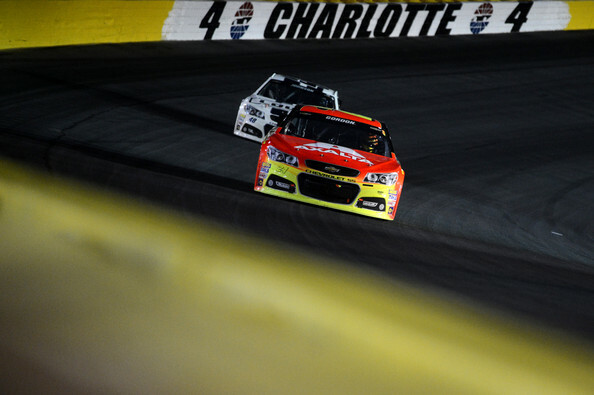 Kevin Harvick passed Gordon with 17 to go, which moved him back to 7th place where he finished. 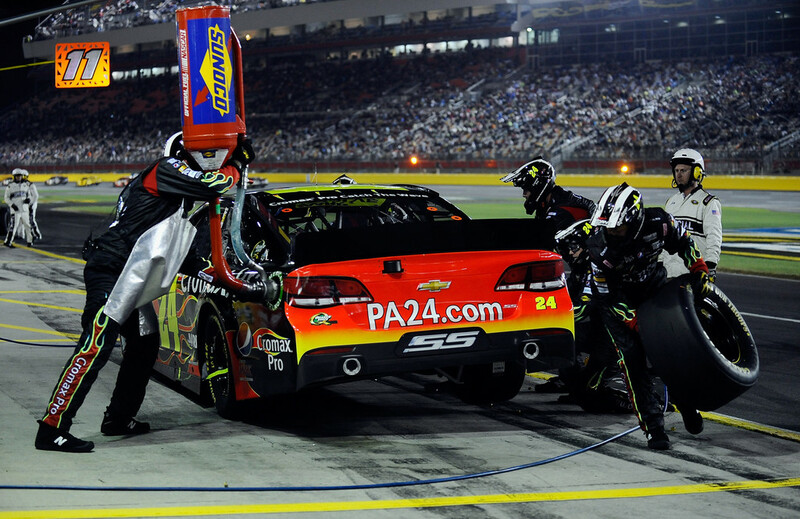 Crew chief Alan Gustafson opted for two tires on the final pit stop, thus mirroring the strategy of Kasey Kahne. 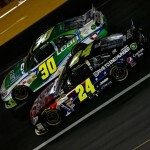 Gordon restarted 2nd alongside Kahne, but was unable to hold the spot due to tight handling. 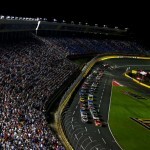 As the day became night during the Coca-Cola 600 at Charlotte Motor Speedway, it appeared that Jeff Gordon’s #24 car was on its way to a top-5 finish. However, a pit stop and ill-timed caution flag trapped Gordon a lap down. 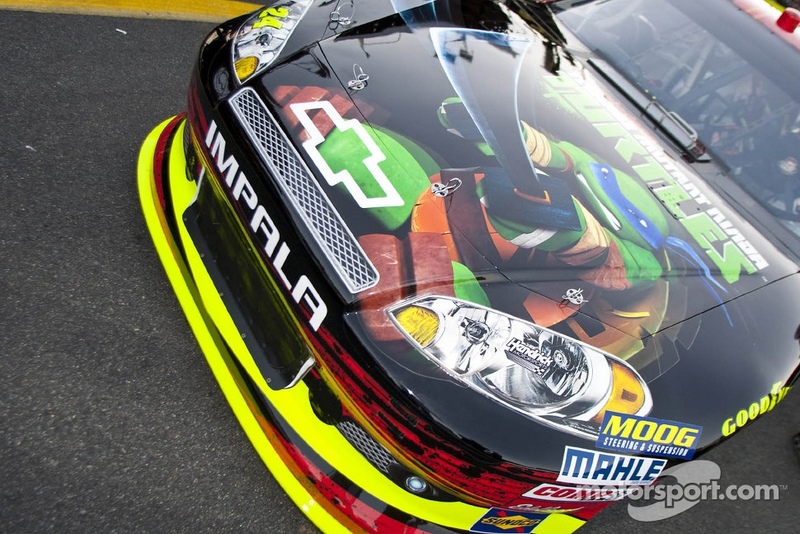 He was later collected in a multi-car wreck and finished 35th — his 3rd DNF of the season. 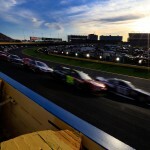 The restart came on lap 130 as dusk descended over the track. Gordon moved into the top-10 prior to a round of green flag pit stops on lap 176. 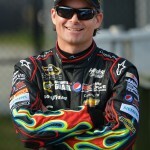 He took 9th from Kevin Harvick on lap 194 and ran 8th at the halfway point of the race. Green flag stops came on lap 222 with Gordon holding 8th place. 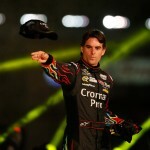 He took 7th from Carl Edwards on lap 233 before a debris caution slowed the field on lap 242. 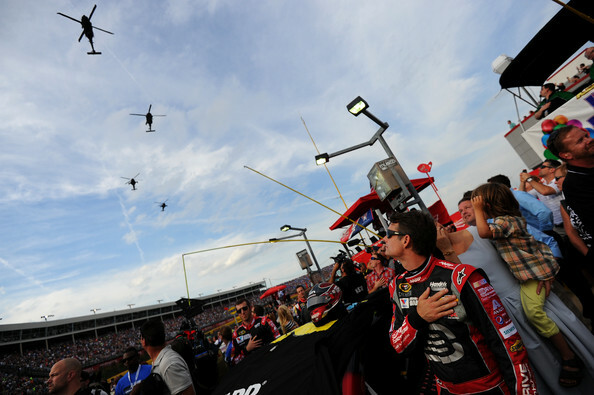 Gordon entered the top-5 with a move around Denny Hamlin on lap 254 and took 4th when Kyle Busch’s engine expired. The caution waved on lap 258 for a multi-car incident after Dale Earnhardt Jr, Greg Biffle, and Dave Blaney made wall contact. Gordon scraped the wall and came to pit road for two tires. 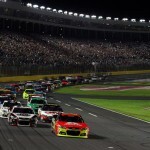 He restarted in 4th place and closed in on Kurt Busch for 3rd as his Hendrick Motorsports teammate Kasey Kahne took the race lead. 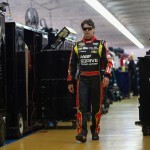 However, he was unable to make headway and dropped to 5th behind Martin Truex on lap 295. He came to pit road on lap 303 just as a debris caution waved. Gordon was trapped a lap down and opted to come back in for left side tires. 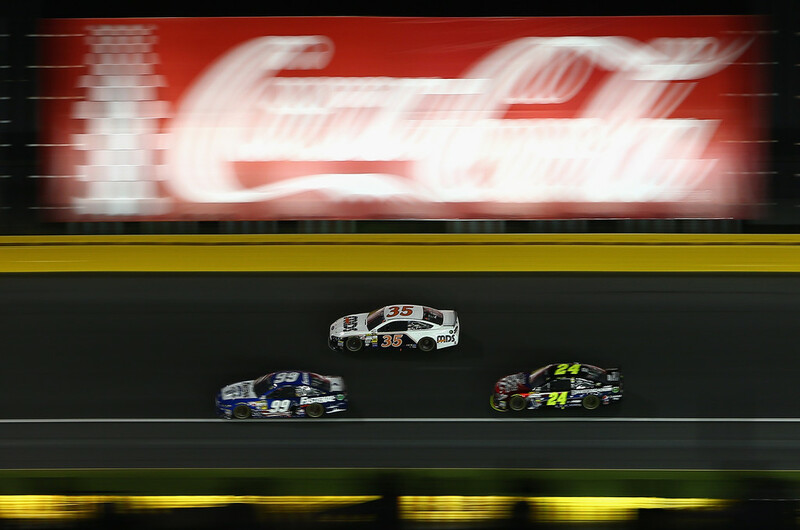 Gordon restarted in 15th place with 90 laps to go. He fell to 16th prior to a debris caution with 88 to go. 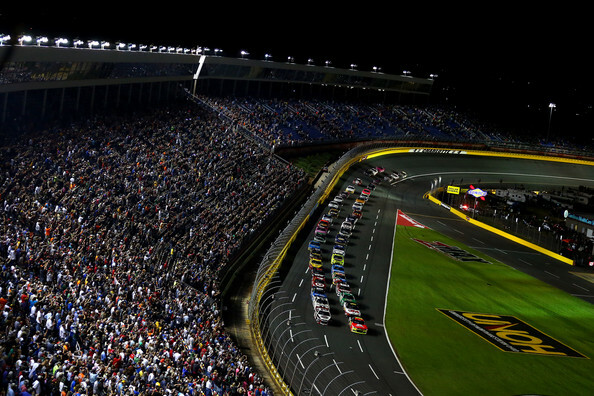 On the restart, Gordon dropped to 19th just before a crash involving Brad Keselowski and Danica Patrick. Gordon came to pit road for tires and restarted in 19th place. 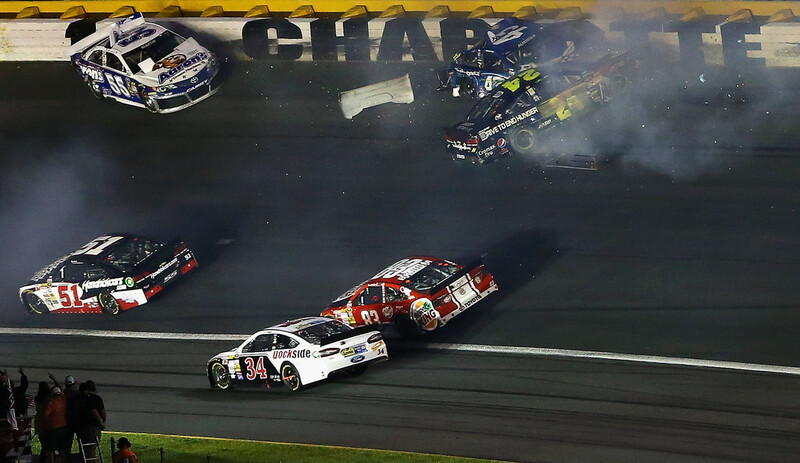 Just after the restart, Gordon was involved in a multi-car wreck in turn 1 that ended his night with a DNF. Gordon came to pit road on lap 303 just as the yellow flag came out. 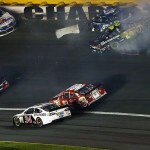 By stopping, he was trapped a lap down and was later collected in a wreck racing backmarkers in the middle of the pack. 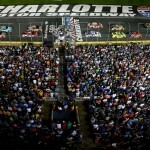 Clint Bowyer held off Denny Hamlin in a fuel mileage battle to win the Bank of America 500 at Charlotte Motor Speedway. Points leader Brad Keselowski dominated the event, but needed a late stop for gas and finished 11th. 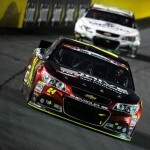 Jeff Gordon struggled with handling for the balance of the night. 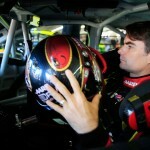 He added to his own problems by receiving a costly pit road speeding penalty and finished 18th. 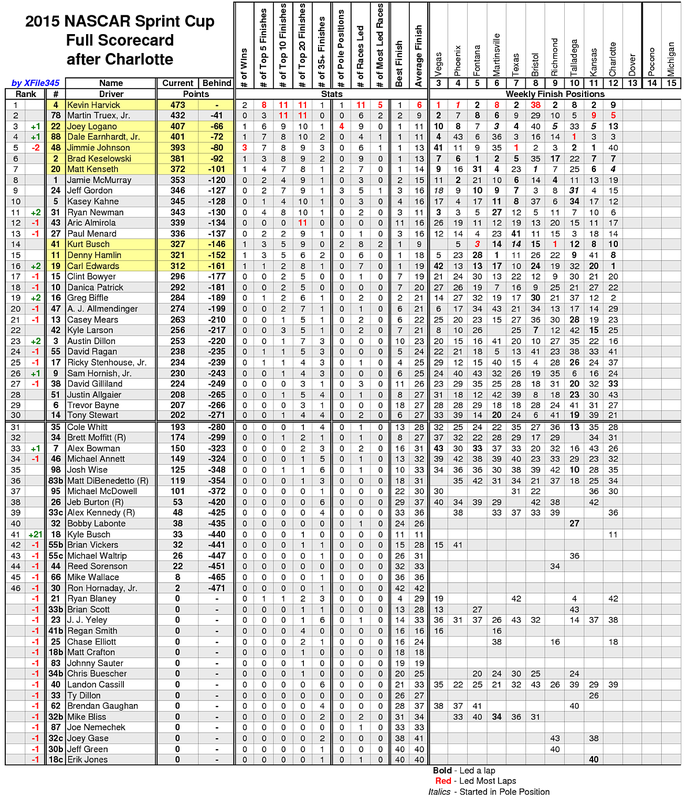 Gordon is now tied for 8th in the points standings, 50 points behind Keselowski with 5 races to go. 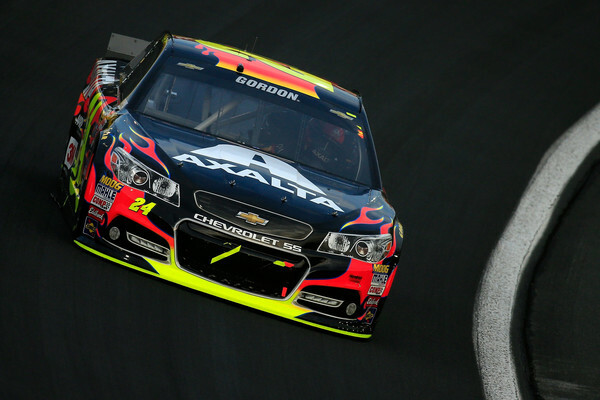 Gordon started 11th and moved into the top-10 within 2 laps. By lap 10 he had advanced to 8th place. The first caution waved on lap 11 for Matt Kenseth’s cut tire and spin in turn four. Another caution just after the restart on lap 16 collected Jeff Burton and David Ragan. Gordon dropped to 10th on the restart on lap 23. He was in 11th when the third caution waved on lap 36 for Paul Menard’s wall contact. Gordon came to pit road for tires and restarted in 18th place. He moved back into the top-15 on lap 52 and ran 12th before a cycle of green flag pit stops. Gordon stayed on the track to lead a lap before coming to pit road on lap 86. He fell to 14th after pit stops. Gordon ran 13th at the 100-lap mark of the event. Gordon ran 15th before a green flag pit stop at lap 214. 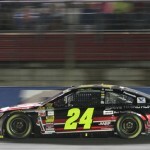 Gordon received a very costly pit road speeding penalty and lost a lap. 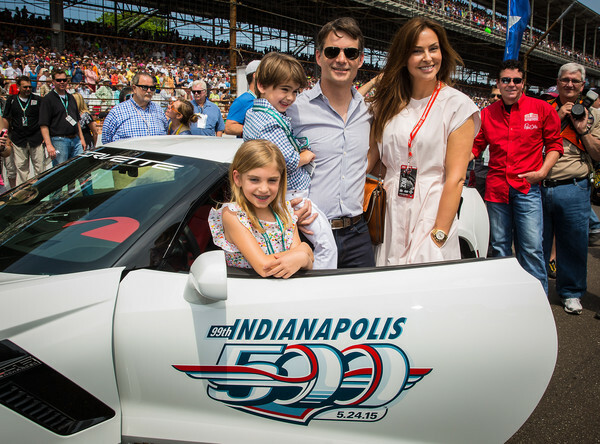 He put himself into position to get back on the lead lap — as the first car one lap down. However, the race went into a long green flag run. With 30 laps to go, he ran in 16th place, one lap down. He made his final pit stop under green with 18 to go. 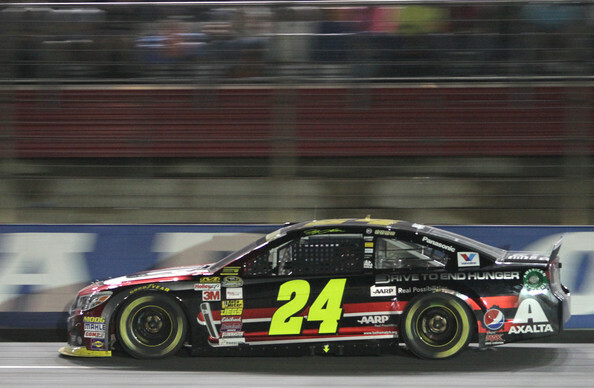 Following the stop, Gordon ran in 20th place with 10 laps to go — hopelessly trapped off the lead lap. He finished the event 18th. 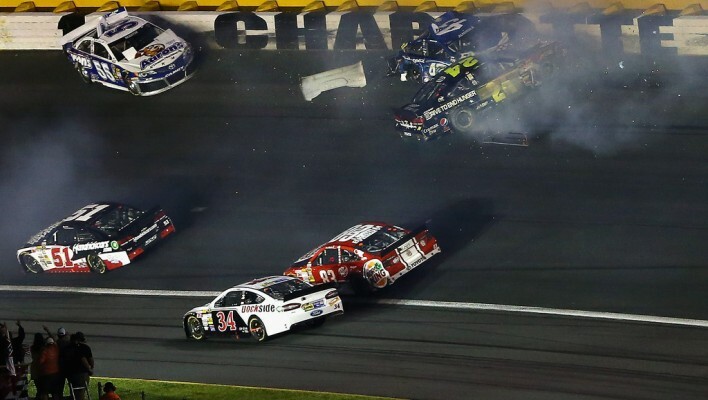 It was his fourth finish of 18th or worse in his last 5 races at Charlotte. 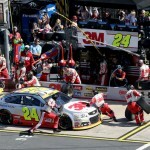 A pit road speeding penalty took Gordon off the lead lap and effectively put a major wall between him and a possible fifth championship in 2012.